I'm in a show opening here in L.A. this Saturday, August 2nd! Titled "get the lead out", the opening reception is from 7 - 10:30 pm at Black Maria Gallery. With many deadlines arriving at once this past month, I only had time to submit one piece to the show, and here she is Ruby and her feathered friends. The show features mostly the works of many talented artists in pencil. Since detailed pencil drawings are not my present style, I was still invited to submit a painting accompanied by a sketch that lead up to the painting. I realize that you might not actually know how I arrive at my designs, so this is a good opportunity to share a little of that process with you, also one of the main intentions for the theme of this particular art show. As it turns out all of my paintings begin in pencil, sometimes with a rough, very loose sketch in a sketchbook and sometimes with the same loose sketch right on the wood panel. I tend not to want to invest a lot of details and time into a sketch. I'd rather invest that in the original painting. If you look closely at any of my originals you might see hints of pencil peeking through the paint. 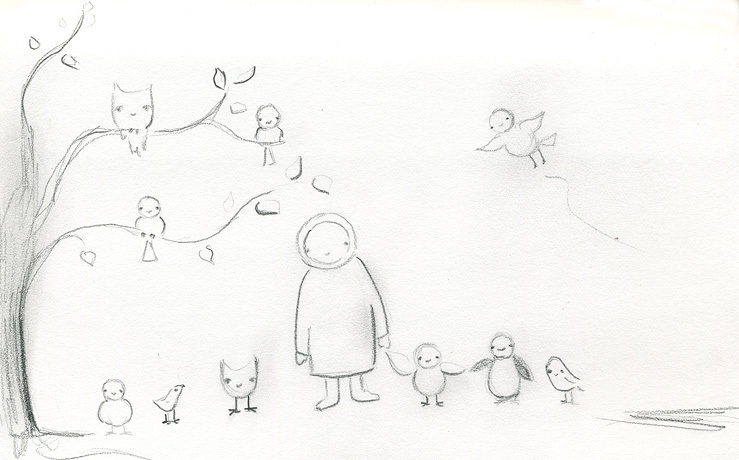 Many times the pencil lines become part of the what creates the personality of the characters. Not something I can plan, it just happens. It's just how the mediums choose to combine on that given day. So here's my sketch below. Flip through any of sketchbooks and you'll find them filled with simple line drawings like this one. And above you can see the finished painting which includes pencil, conte crayon, acrylic and paper. It looks like a fabulous show, featuring a great collection of talented L.A. artists. And might I also add in continuation again of last Friday's topic regarding art. My "cute" painting is in a show accompanying many styles of art, including a wonderful piece of a skeleton with two heads. So you see, we can all co-exist combining to make for a very eclectic and compelling show. I'm not yet sure if I will be attending the opening this Saturday, but if I do maybe I'll see you there! In the meantime, you can get a sneak preview of all the pieces right here. happy creative thursday to you!! 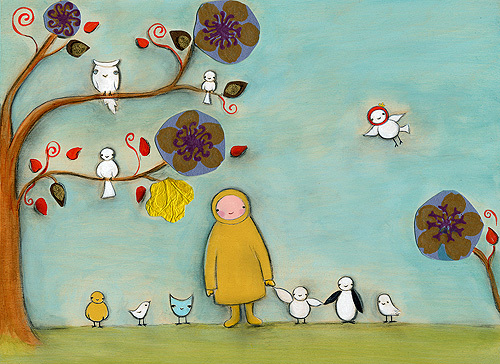 ...almost forgot to tell you that I have added "we all flock to Ruby" over as a print at Etsy. Today is turning out to be quite a creative day. 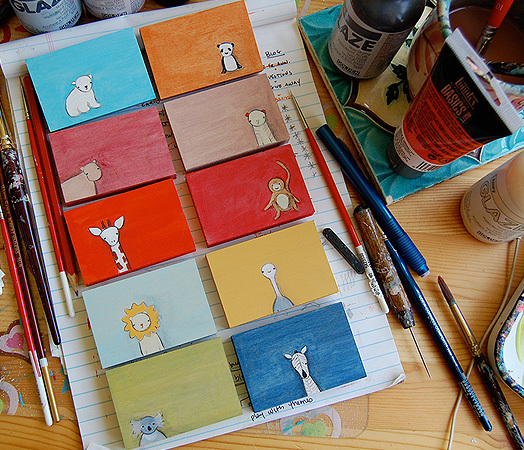 I intentionally set it aside to get some painting done, and I'm happy to report that the creative juices are flowing. I'm wondering if maybe the earthquake literally shook some things loose. Maybe it's that little reminder that life is precious and half of what we worry about is pointless, that we should just enjoy ourselves more. Honestly in the last 10 days I've had enough reminding of this concept to last me a bit. I get it. Really I do. Ever since the news about David, life has been feeling momentarily more delicate. I forgot to tell you that surfing was a bit of a scare for me on Sunday. I had a good time, especially the coffee and breakfast part of the day, but let's just say I was held under the water a little longer than I would've liked when a set of 3 HUGE waves appeared out of nowhere and crashed right where I was, which caused my leash (the plastic connector between your ankle and your surf board that keeps your board from flying off without you) which in this particular instance I would've preferred that it fly away without me attached. The leash tangled itself in several loops tightly around my ankle and when the wave hit, my board yanked me under water, forcefully dragging me by my ankle. I think the rush of fear kept me from taking a deep enough breath and when I finally came up for air, I didn't think I could've stayed under a moment longer. I did what you did when you fall of a horse, I got right back on the surf board and went out again. And all was fine until I came in and due to another powerful wave, the fin on the bottom of the board nailed my upper thigh, where now I have a black (there's no blue in there) bruise the size of a lemon. At least it hit the most "padded" part of my body. And luckily I surf with boys who sympathized with me and then reminded me that this kind of thing comes with the territory and getting pummeled by waves "is not really too big a deal". That's when you realize that we girls don't always learn how to take a "fall" the way boys can. The waves and I have since made peace and I still LOVE my surfing. You decide in life that it's worth whatever "risk" to do what brings you the most joy. And I decide to go in the ocean and I decide to live in California, big waves, earthquakes and all. It is still SO worth it. All I'm saying really, the point of this long paragraph. Moments like these can really make you feel ALIVE ~ and I'd much rather feel ALIVE than AFRAID. I GET it. Endless appreciation for my life every day. 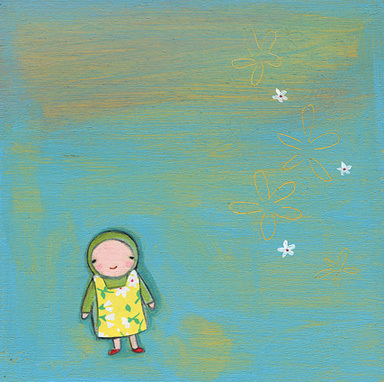 I'm working on paintings for an upcoming show and this tiny girl appeared. I am calling her Helen. And the title of today's painting began as "My name is Helen" and then I was listening to my party shuffle on ITunes, (I'm a big song "shuffler") "The 59th Street Bridge Song" by Simon and Garfunkel came on and suddenly Helen was "feelin' groovy". And she needed a little yellow apron with flowers to wear in her grooviness. I leave you with another excerpt of the lyrics from the song that inspired this painting. "Life I love you, all is GROOVY." Ok, as I'm sure you know the news tends to sensationalize a bit. I don't think that I was in the strongest part of, but I DID feel it. And this being my third earthquake, I have to say it was rather exciting. Really, you'd almost have no idea an earthquake had happened as I continued my errands out in Los Angeles today. I kept having to ask people "did you feel the earthquake?" and most did and some people didn't feel a thing, and some people looked at me like maybe I was just a tad too "enthusiastic" about the experience. If you're not a Californian, I think that you have to realize that people here are used to them, and those who've been through them before, especially the big Northridge quake in 1994 (which I was not here for), don't panic over these kinds of smaller quakes. The funny thing is that I was at lunch with my new friend, Amber. I had planned on introducing you to Amber here on my blog, just not in conjunction with an earthquake. But ten minutes into meeting each other for the first time, we shared a salad and an earthquake outside at The Grove. By the time we realized what was happening, it was over, as is common for earthquakes, usually just lasting a few seconds. We did both look up at the huge two-story glass windows we were sitting by ~ wondering when and if we should move away from the glass that might break above us. But it turned out not to be a concern, and we calmly went on with our lunch, after our adrenalin rush settled down. And it turned out to be such a great lunch and visit. This is yet another story of a friend I've met via the internet. 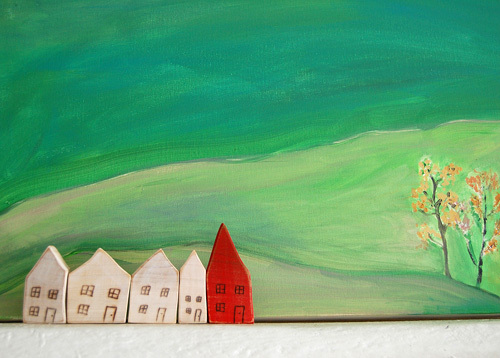 I "met" Amber through Etsy when I bought some of her beautiful wood creations, the sweet little houses in the photo above. Amber's other identity is Woodmouse. 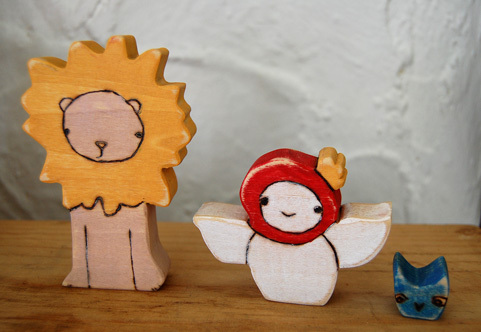 She makes the most charming wood toys and sculptures. 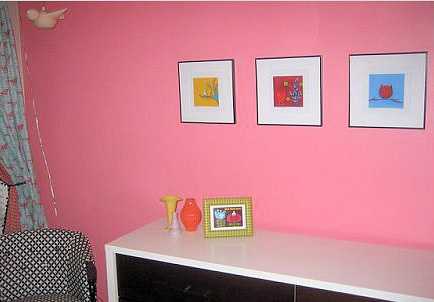 I instantly fell in love with her house series and could literally line them up endlessly in my home. When I bought the houses, Amber asked if she could sculpt some of my characters for me in wood. She often takes on commission pieces. And these are what she came up with. Aren't they fantastic?!!! I LOVE them. I think she did a perfect job capturing the spirit of lewis, olive and oscar. I brought them home with me today where they now happily reside in my studio. All I can say is Amber is as sweet as her creations. An entrepreneur, (she has quite a few accomplishments under her belt that she is incredibly humble about), a stay at home mom, a talented artist and another thoughtful, lovely creative spirit who I am excited to say shares the same city as me ~ as this way we can have more in person visits, hopefully minus the earthquakes. You can learn more about Amber over at her blog, and purchase her creations here at her Etsy shop. And...psst...she let me in on an exciting secret today, and all I will say is if you fall in love with something at her shop, I'd probably buy it right away! so great to meet you Amber!!! On the heels of Friday's post, I just want to say that to be able to add joy to someone's home, especially the rooms of the little ones ~ this is one of the reasons I do what I do. One of my early and now fiercely loyal Etsy customers is Mandy. 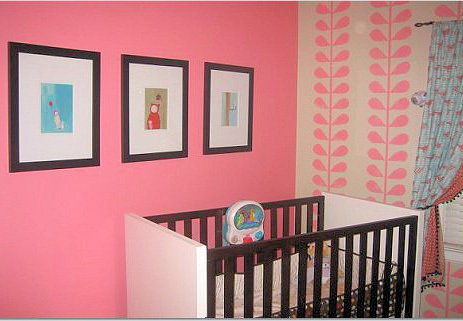 Recently she sent me photos of her sweet little girl, Meta's room. Mandy was putting this collection together last year, just before Meta arrived. There's nothing better than actually seeing your art hanging in someone's home, or as I always like to call it, viewing art in it's "natural habitat". And connecting with Mandy is another reason I love what I do. Mandy is one of the nicest people I've "met" through the internet. Her emails just spill over with such a genuinely joyful spirit, it's infectious. She has been and continues to be such a wonderful customer. I can't thank her enough for all of her support. A mom to Jett and Meta (in the photo above), Mandy is also a fellow entrepreneur. She owns an adorable online shop featuring clothing for small children, called Night Owl Baby and a gourmet popcorn business with her twin sister in Indianapolis called Just Pop In. too many birds and bears in the art world? And are you challenging yourself as an artist? It was not my Friday morning plan to write a long blog post, but I couldn't help myself. I was over at Holly's blog this morning and saw a post she wrote yesterday, about the recent tea towel show I was in. Within the comments is a very interesting discussion going on in response to a comment from Pippa Rex. And I felt compelled to share it here with you and also offer up my thoughts on this subject, as I was one of the artists in this show with bears and birds and cuteness in my creations. And really you might wonder about this yourself in regards to my style of creating and also in the art world in general. It's a really wonderful topic and another reason I love blogging so much, because we get to have these kinds of honest and insightful "talks" with one another in such an open forum. "Now I am not just talking about these tea towels but I have to finally say this as you finished your post by talking about the risks taken in the art world. 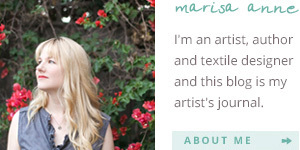 Does it not bother you that most of the "art" posted here and on other design blogs is all the same. It seems to me that there is an awful lot of silhouette trees and birds, childlike drawings of little girls and bears etc and they are all done by various artists. I guess that I think that there is little risk there. I read your post about how peoples houses are all becoming silimarly decorated (How many "Keep calm and carry on" posters can this world handle? I feel the same is true of this "art" world. When did art stop being controversial or at least personnal. Is this form of art really not just craft?" "Hi Holly ~ thanks so much for sharing and Maya, again thanks for inviting me to participate in this show. I am truly loving this discussion via the comments. So thanks to, to Pippa for bringing it up. Since I am one of the artists of the show and you can clearly see my towel in the images above with both a bear and a bird (and good lord, another owl!) on it and cuteness just dripping from it, I feel inspired to share my thoughts here. The funny thing for me is that a) I never thought I would make a living as a painter and b) I never at all thought about letting "cuteness" especially with animals be my subject matter. In fact one of my favorite stories to tell is that my photography teacher in college told me once that "cute doesn't sell". The style that I presently work in developed all on its own. I just remember trying to paint a character for a show theme a group of us had almost 3 years ago now and that was so much fun, it inspired me to go further, and challenge myself with creating characters, because it was something I didn't think I could do. 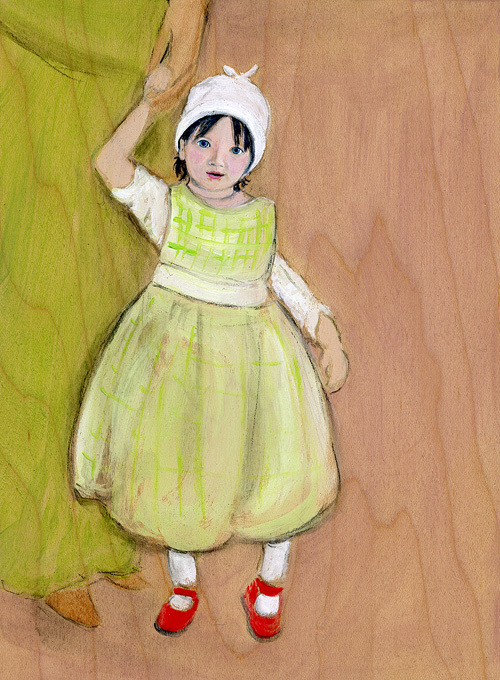 Then through the process of daily painting more and more of them literally kept appearing in my paintings. It was like a creative faucet had turned on and it couldn't stop. And I would ask myself the same question, "I mean really, can I paint another bear or a bird?" but the truth is I couldn't help myself. And looking back at my childhood and what I created even then, the attraction to cute has been there from the beginning. And every time I try to push myself in a new direction, it feels forced. So these kinds of childlike drawings embodying a certain innocence, joy, hopefulness, simplicity~ they represent the truest part of me right now at this time in my life. From a small business perspective, it is convenient that these themes are trendy right now. I have even been asked by galleries to paint them because they are "what sells". And I have to be honest and say that as an artist who makes a living with their art, I am always walking that fine line of, "is this my true inspiration and is this something that will sell?". So there is a part of me that wants my work to sell because I love what I do so much and I want to keep doing it, and there is a part of me that is always trying to challenge myself and ask the questions you are asking, especially because I pride myself on not making decisions based solely on financial survival, and most importantly I also want to keep growing as an artist. Somewhere in the middle is where my creations find their voice. I am also continuously influenced by the art that inspires me and am often interpreting and incorporating what I see in the world around me, into my own art. I do think that while we see a lot of the same themes as you mentioned with "birds, animals and childlike drawings" in art and featured in the world of design and design blogs ~ there's a reason that it is received so well. I feel that there is a present theme of happiness, and beauty among many of the artists creating work today, and I think people are in search of more of that in their lives and this kind of work, and the design blogs that feature it are reflecting that back to them. It happens to be the art I personally collect, because I too want more happiness in my every day. And I when I look around my home and feel uplifted by what I see, it feels so good. When I travel the internet and visits beautiful blogs like this one, I feel good. It's that simple. I just want to feel good more of the time. I often feel that "controversial" art is from a pushed place of the mass idea that somehow "art isn't good unless it's controversial". There are artists for whom controversy is their true voice and you can tell that it's genuine and compelling and interesting. In the same way that artist's who paint sweeter, less controversial images are either faking it because it's popular, or it's also their true voice. Either way I find that genuine art in any form speaks to most people. And really in regards to taking "risk", ANYONE who is willing to create ANYTHING and share it with the world....now that is truly RISK. Every time I put something I make out into the world, it feels risky to me. Every time I wonder how will this be received? Even writing this comment, I wonder. And then I remind myself that however it is received is ok, and that all I am asking from myself is that I be satisfied with what I put out into the world. I really just want to keep creating from my heart and let that be what continues to call me forward. Which, in closing I have to say that translating my style and my characters to a tea towel for this show, was challenging and so much fun ~ it opened me up to a whole new world of creating that I am just at the beginning of. " It was time for some new tiny ones. I photographed these today, arranged on my "to do" list. Mostly the week has been filled with a lot of the "less than fun work"combined with an obviously lower spirit than usual, but today my spirit is resurfacing and I knew it was time for some creativity. So painting preceded to happen right on the "to do" list. And now back to the list. You can find these tiny originals over at Etsy. My second post over at the new blog! This painting was a special gift for Sean's brother Kerry and his wife Gabby. This is their adorable, and oh so sweet daughter Saoirse (pronounced Seersha ~ a beautiful Irish name) who just turned two this month. I painted this from a photo taken of her just last year. I thought you would enjoy seeing this little cutie and also seeing a very different painting style. It's always fun and challenging for me to mix it up a bit with the painting process. 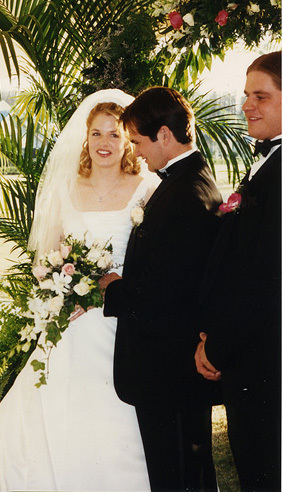 I meant to say on my anniversary post, that I never imagined blogging would be so much FUN. I *heart* blogging!!! times two :: celebrating 2 years!! Today is a very special day. 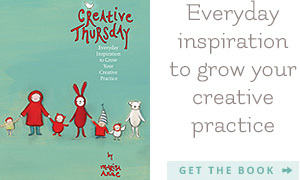 It is my official two year anniversary of the Creative Thursday blog. So I'm changing the tone back to joy today, and I thank you immensely for all your kind comments and thoughts from yesterday's post. This is my chance to tell you again how much I appreciate all of you who visit this blog and to those of you who comment so frequently, that I have the pleasure of knowing a little more each time I hear from you, you feel like my extended circle of friends. I still can't begin to express in words the joy I feel when I create these paintings. And I feel so lucky every day to live this creative life. I will repeat what I wrote in my daily painting email today ~ Creating these paintings and sharing them with you is a highlight in my day. Thank you for continuing to join me on the journey. 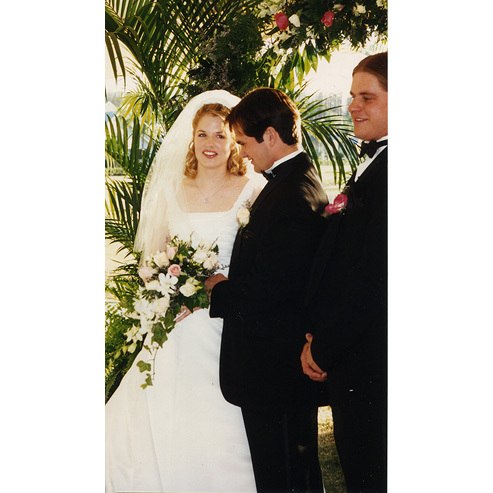 If you know me personally or have been following the blog for quite a while, then you may know that I was married before, and the first 11 years of my adult life were spent along side Art Haedike. I don't mention it much, as it's personal and between us, and this blog is mostly about my creations and my present life experience over the last two years now ~ but my marriage was a wonderful one in so many ways mostly because of the person I was married too, yet life sometimes still manages to take us in different directions. I am however endlessly grateful for the time we spent together, and also for the Haedike and Landess family, who made me feel a welcome part of their family from the first moment I met them. Yesterday, I learned from my ex-husband, Art, that his brother, David, passed away unexpectedly on Friday. He was only 32 years old and leaves behind two children of his own. It is at this point of the post that I am simply at a loss for words. The shock of this sudden tragedy is settling in and my heart is breaking for Art and his family. I can't begin to put into words anything other than the fact that David was one of the kindest, gentlest people I have ever had the privilege of knowing. So in some small form, this post is my way of remembering such a humble, gracious and beautiful spirit. I chose the photo above, that shows David on the right side, because it was a photo where David wasn't posing and it happened to capture what I remember about him most ~ his soft, loving presence and his sweet smile. I have debated whether or not to share anything regarding this here with you, but decided that I would ~ as we can never be reminded enough to appreciate our loved ones, to appreciate the life we are living, to slow down and live fully in every moment and to tell the people we love how much we love them as often as we can. It's never too soon or too late to share with those close to us, how much they mean to us. I also didn't feel like I could post on my blog this week as if nothing had happened, because no matter how much joy I want to share here (and that is one of my main intentions with this blog), this is still an honest slice of my life, and at the moment my heart is saddened and reflecting once again on all that is truly important to me. Also for my family and friends who may keep up with me here at the blog, especially those of you had the chance to meet David, I thought you would want to know as well. So please send loving thoughts to the Haedike family and hug those you love a little tighter today. Can't really tell on this one, who is taking advantage of the photo opportunity ~ is it the little blue bird or the baby bear? That last line speaks to me every time. So I didn't make it back here yesterday as I had hoped, but my heart was full and today I did manage to squeeze in a little creativity among errands and a trip to the dentist (my mouth is finally returning back to normal after the numbness). I don't know about you but it really feels like summer and I think that the relaxation from vacation and taking some down time is still present, which is a good thing. I've been feeling tired and I've been giving into it. I've also in general been moving at a much slower pace and taking time, especially to visit and catch up with friends and I have to say it feels really nice. Which I have to take a moment to mention here, if you like wine and delicious food and a nice but not too pretentious atmosphere, and you're here in LA ~ add a relatively new restaurant to your list to visit. My good friend Nancy made the discovery, and it's called Tasca wine bar, on 3rd street in West Hollywood. As a business owner I truly appreciate any business that takes great care and pride in their business down to every last, tiny detail. And as a great lover of food wine, I'm happy to report that this restaurant is above and beyond in both of these categories, not to mention that our waiter shared the same passion for food and wine. He also let us take our time and linger, which in LA can sometimes be a rare phenomenon. So that' all here for today. I hope you had a good Creative Thursday. I'm off to keep the mellow feelings going with my favorite yoga class, with Coldplay blasting on my car radio I'm sure. Whatever it might mean to you today, I say...........Go and try!!!! !